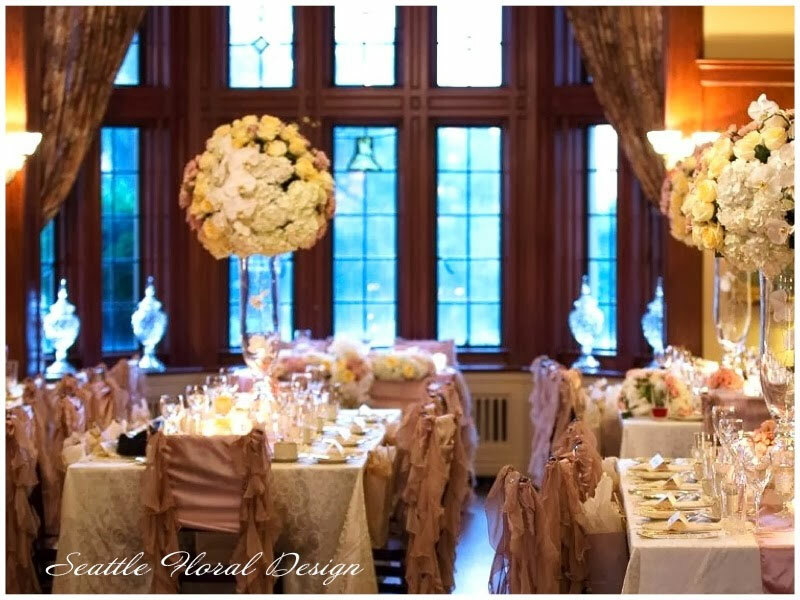 Out beautiful bride Kristy wanted her wedding to be unique, soft in colors and elegantly decorated . 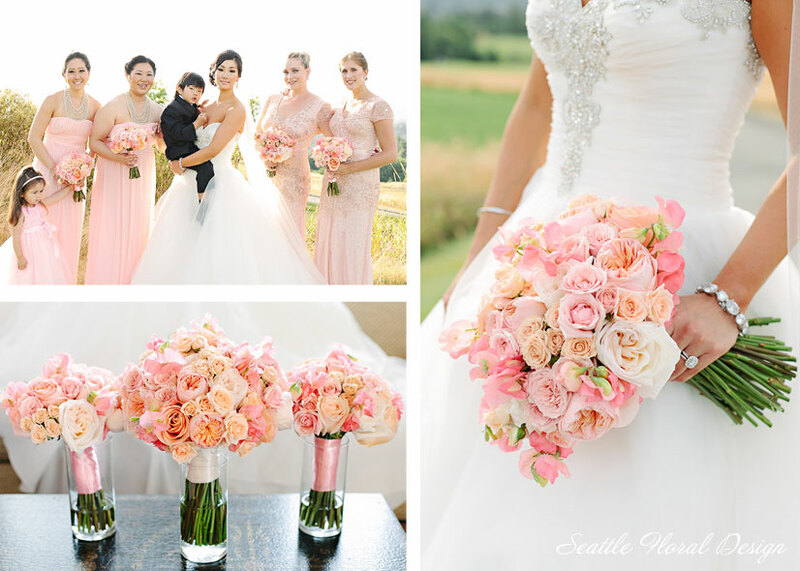 The bridal and bridesmaids’ bouquets were perfectly matched to the colors of the dresses. Who would have thought we could have peonies in August! 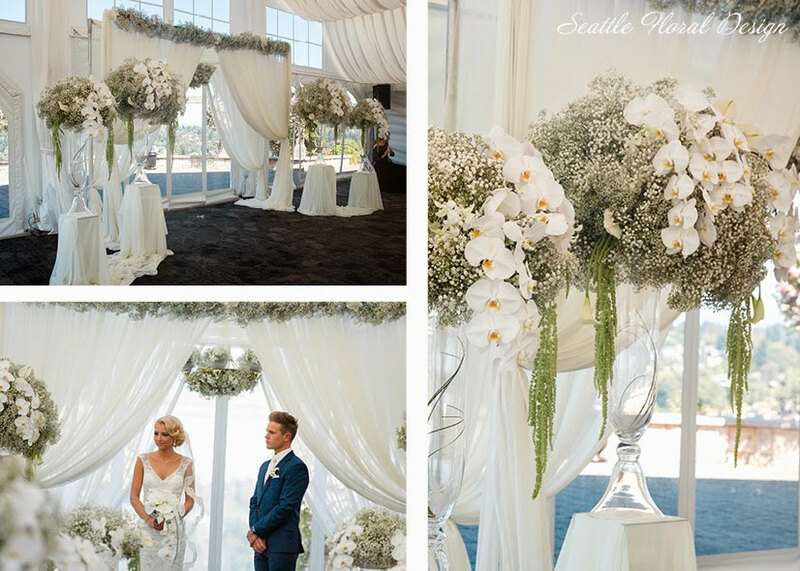 The romantic look of the arch with hanging orchids with off white soft and light drapery made the Four Seasons ballroom just dreamy. 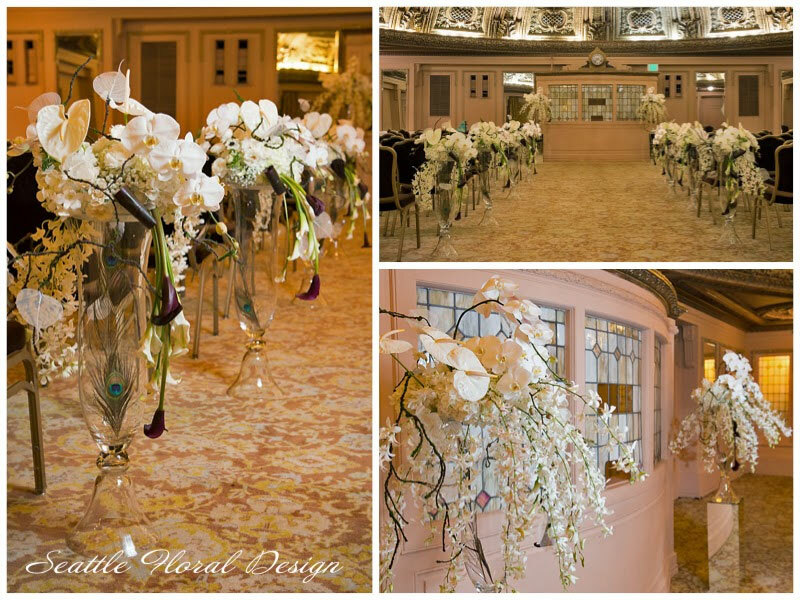 We incorporated some unique modern elements as mirror stands for the aisle and mirror vases for the guests tables. 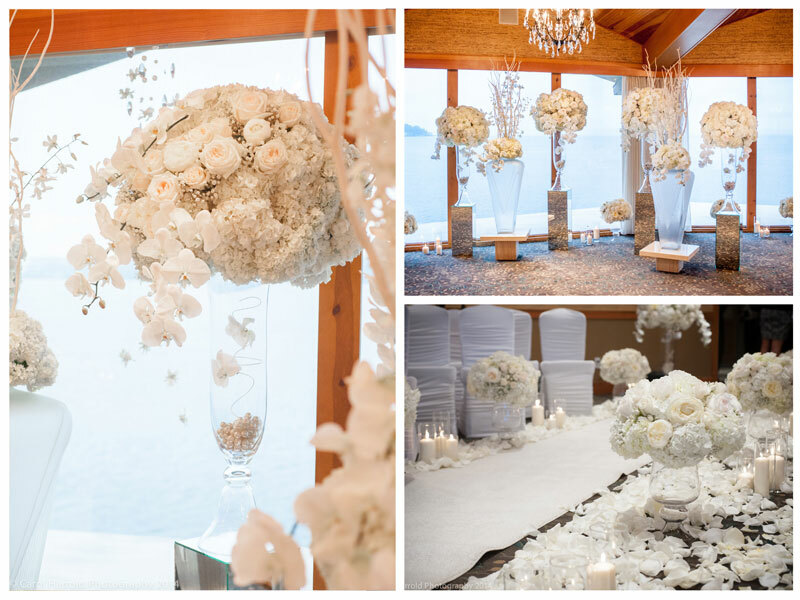 We designed a mix of high and low arrangements using them as part of the ceremony décor and afterward for the reception tables along with pillar and floating candles to bring even more romantic feel at the reception. 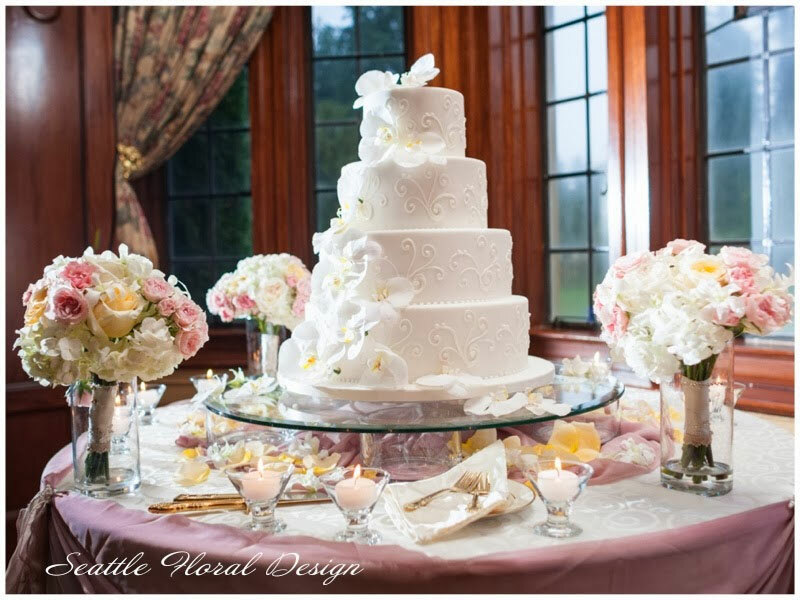 The five tier cake was finished with fresh flowers, orchids, roses, and peonies placed on a glass with the flowers under. 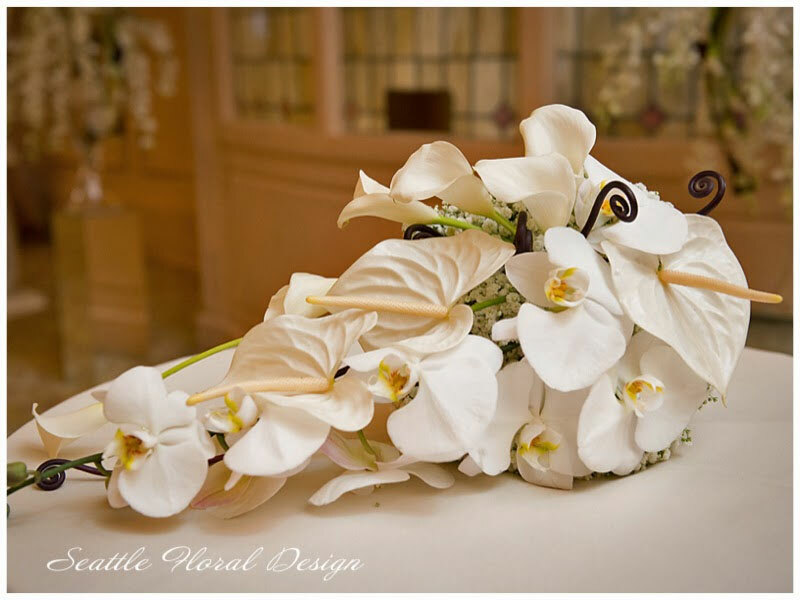 The cake table was framed with an arch of hanging orchids. 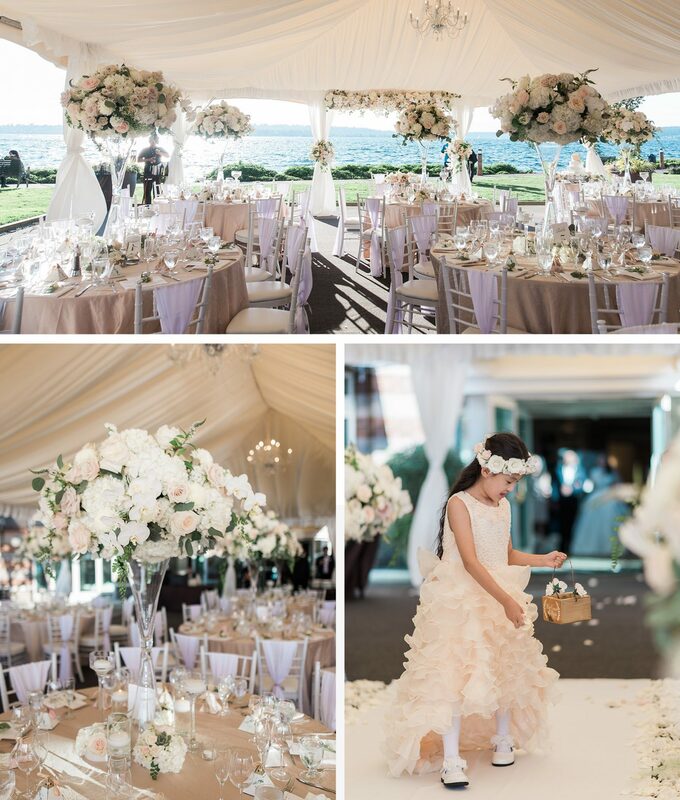 Congratulations Kristy and Teddy! 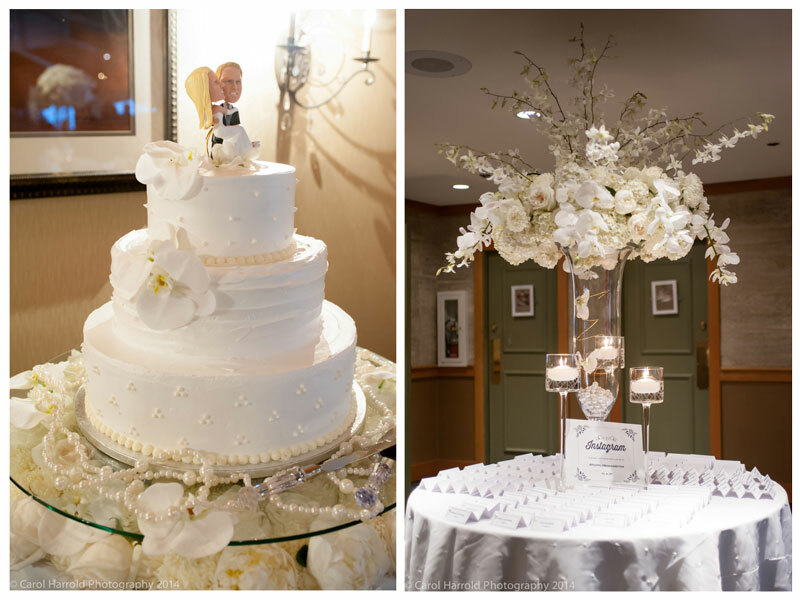 Thank you for letting us to be a part of your special day! I met with Bijun just a few short months before her wedding. 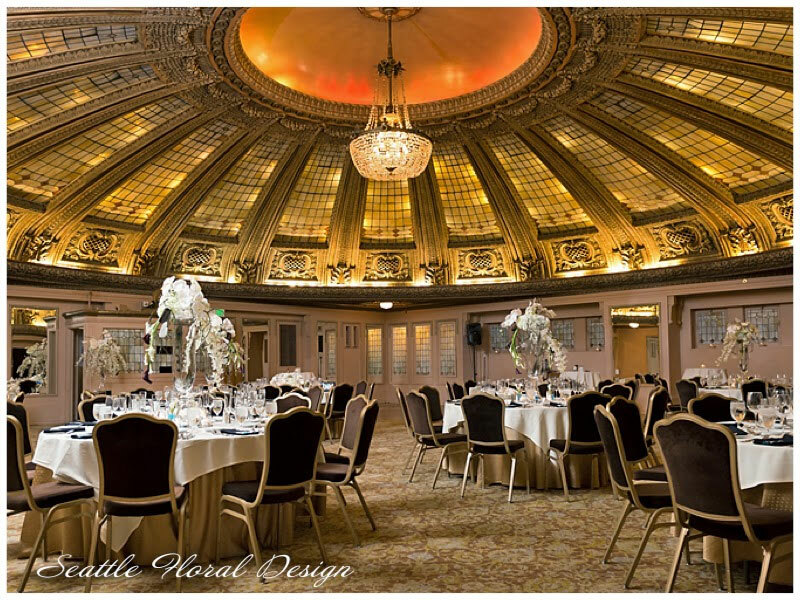 As we looked over my portfolio of wedding floral designs it was clear Bijun was looking for something very extravagant but also showcasing Pacific Northwest feeling. 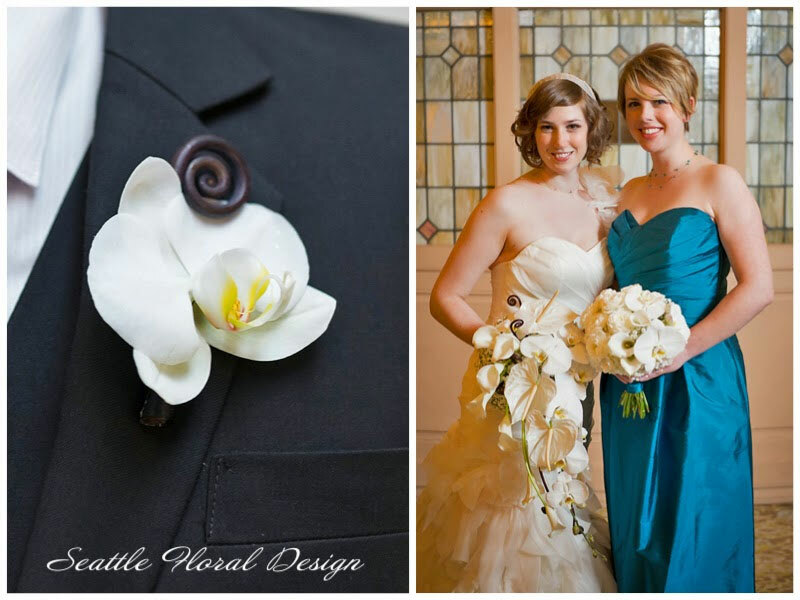 We started designing her wedding flowers from her bouquet where we included smiling Phalaenopsis orchids, garden roses, sage greenery, and silver succulents that Bijun really liked. 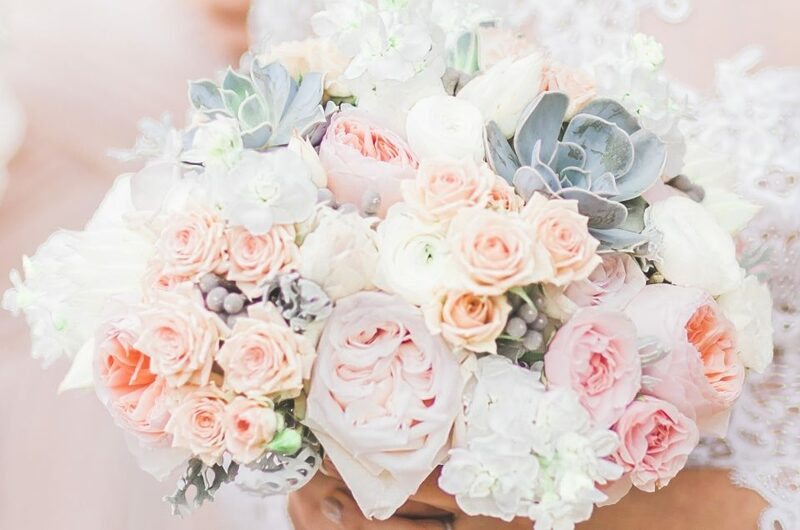 Succulents were added to the bridesmaids’ bouquets as well as for small arrangements around tall luxury floral pieces. 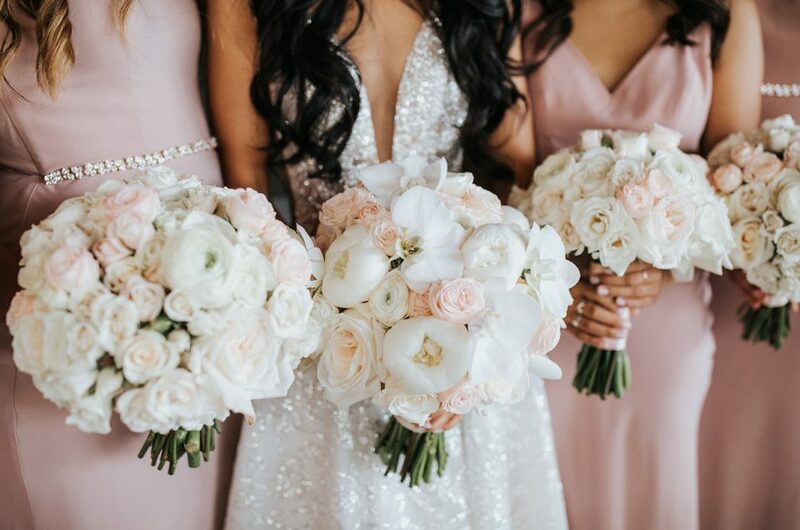 Soft colors of the bridesmaids’ dresses were a perfect match with off white, ivory, blush, champagne, and light peach flowers. 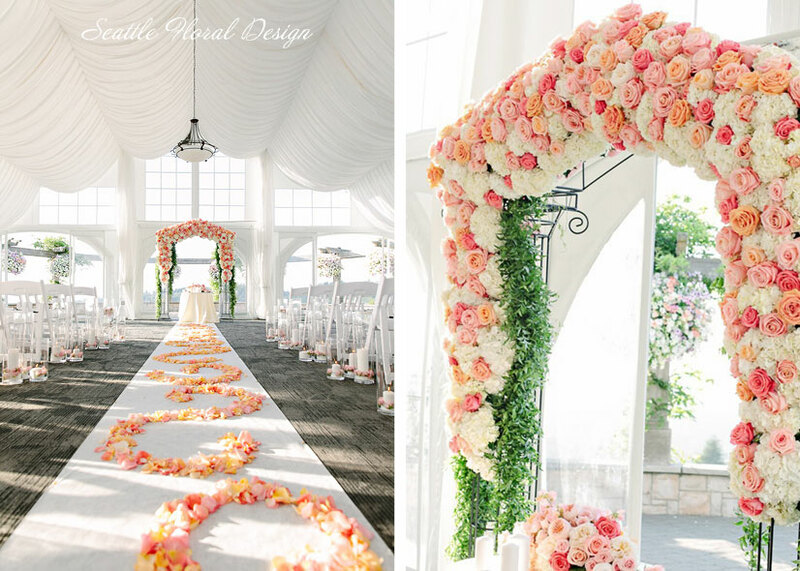 The hanging ceremony arch was designed with garden roses, orchids, and green elements. The arch looked so alive as it moved from the light breeze coming from Lake Washington. 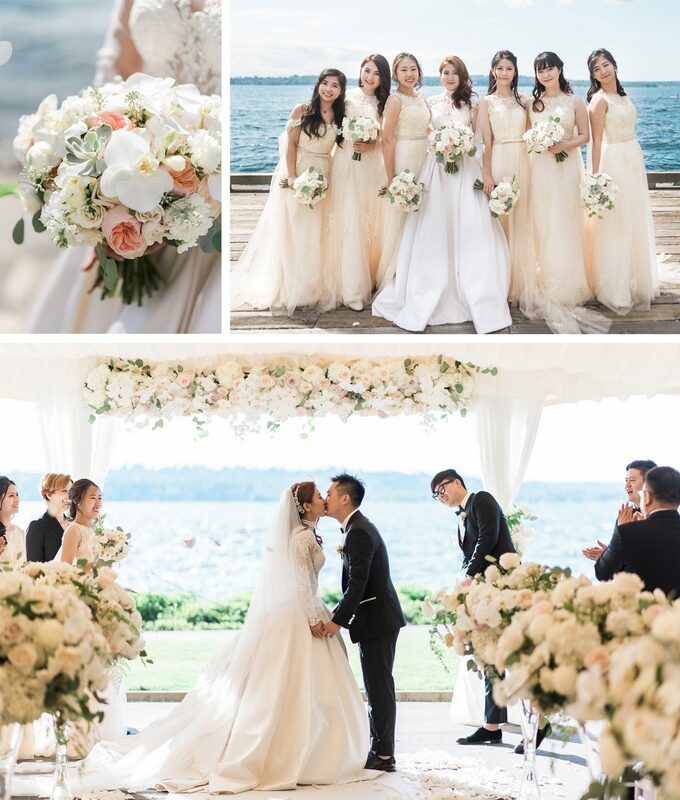 It was a perfect sunny day at the Lake Washington waterfront for gorgeous wedding of BIjun and Tang! The names of the vendors who made this day unforgettable is on a bottom of the page. 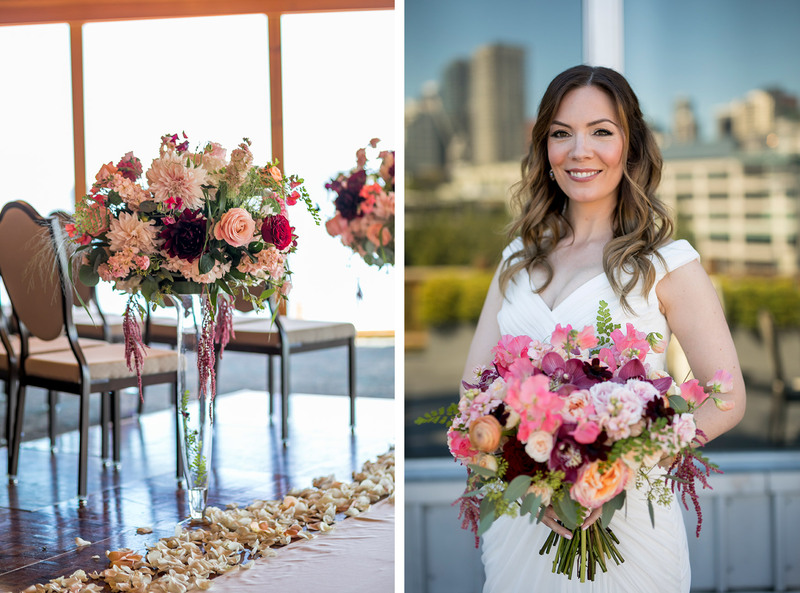 Larisa and Matt’s wedding was held at the Edgewater Hotel, Seattle’s only waterfront hotel with a stunning water view. 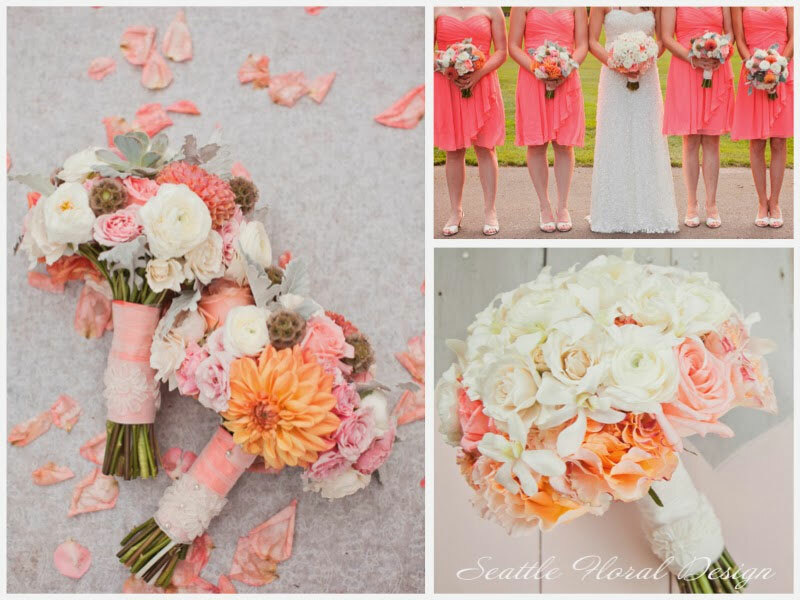 Vibrant flowers in coral, peach, blush, and burgundy with fresh greens added warmth and inviting feel to their wedding. 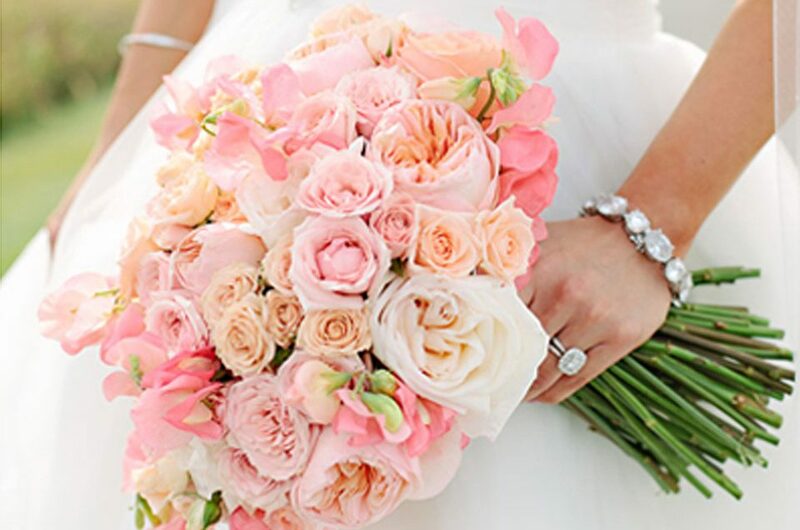 Bridal bouquet was designed using peach garden roses, blush miniature roses, coral sweet peas, burgundy orchids, arranged with eucalyptus, Italian Ruscus, and other fresh greens. 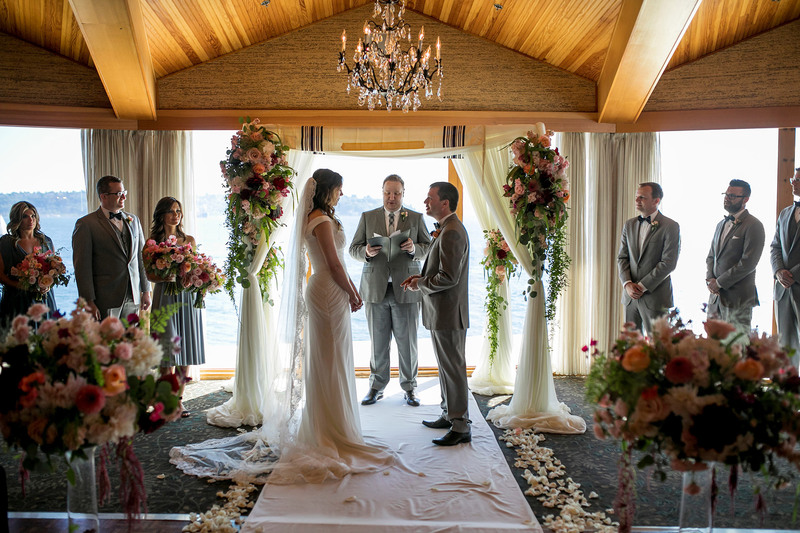 Larisa and Matthew exchanged their vows under a chuppah, significant element of a Jewish wedding ceremony, tastefully designed with the flowers in peach, blush, corals, burgundy colors, and green garlands. 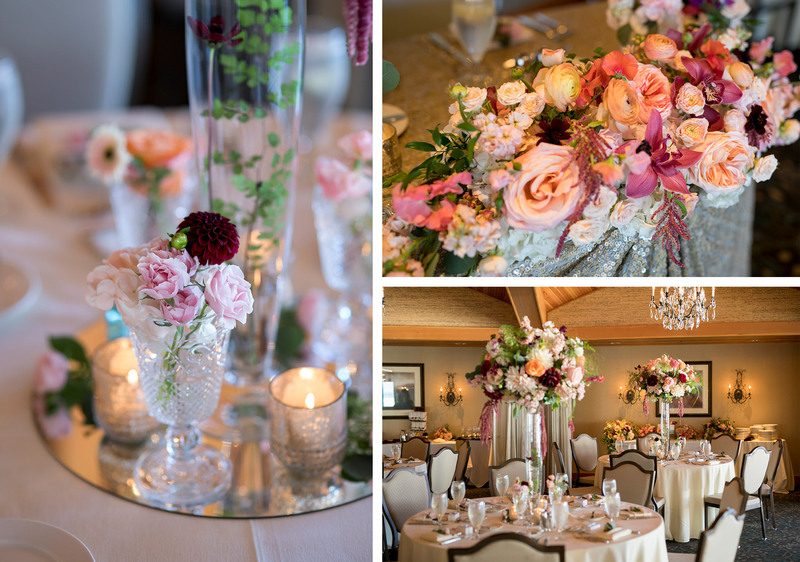 We used garden style tall table arrangements to dress the aisle and placed them back after the ceremony on the tables along with other beautiful decorative elements, crystal glasses and mercury vases filled with flowers, mercury candles, and a napkin décor. 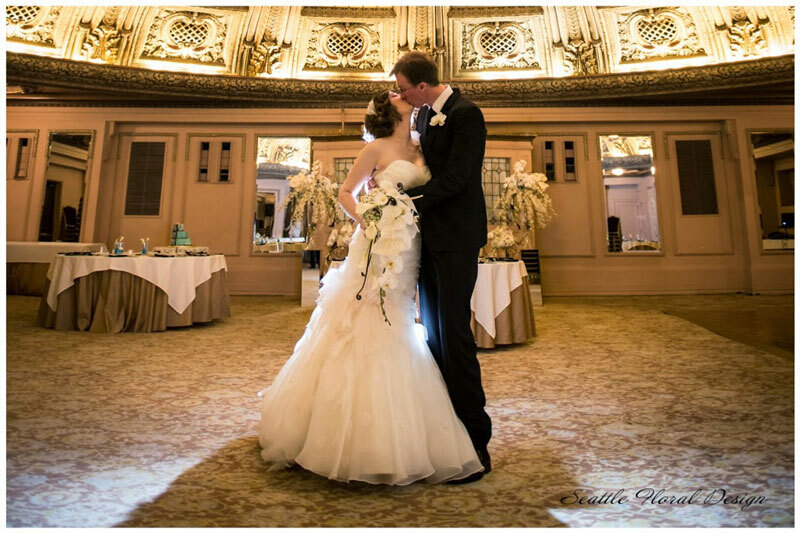 Larisa’s vision of her dream wedding came to the live! 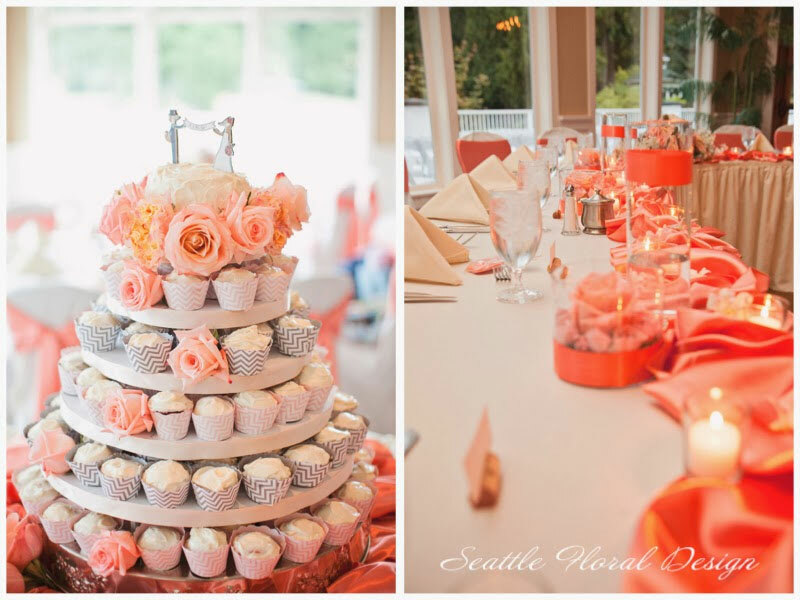 Wedding Day Coordinator – Wishes! 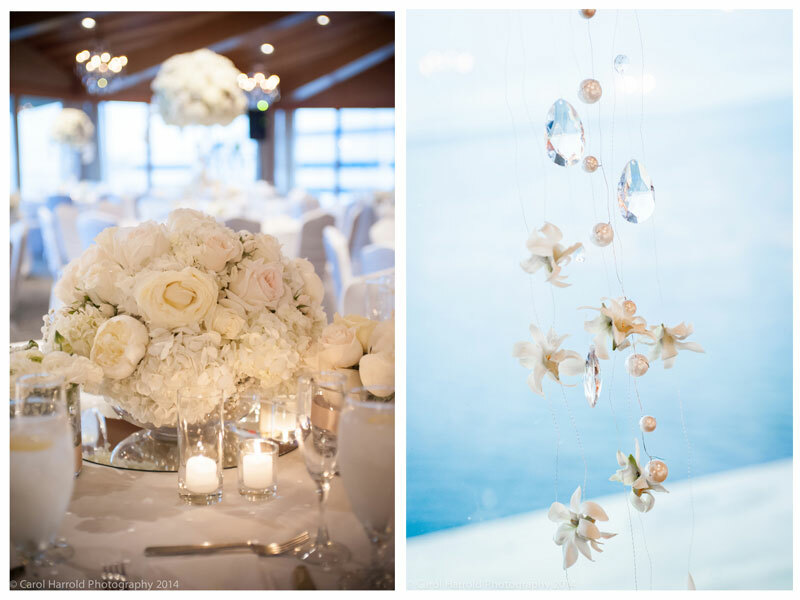 The wedding was taking place at a luxury Edgewater Hotel on the waterfront with the most spectacular views of Puget Sound. 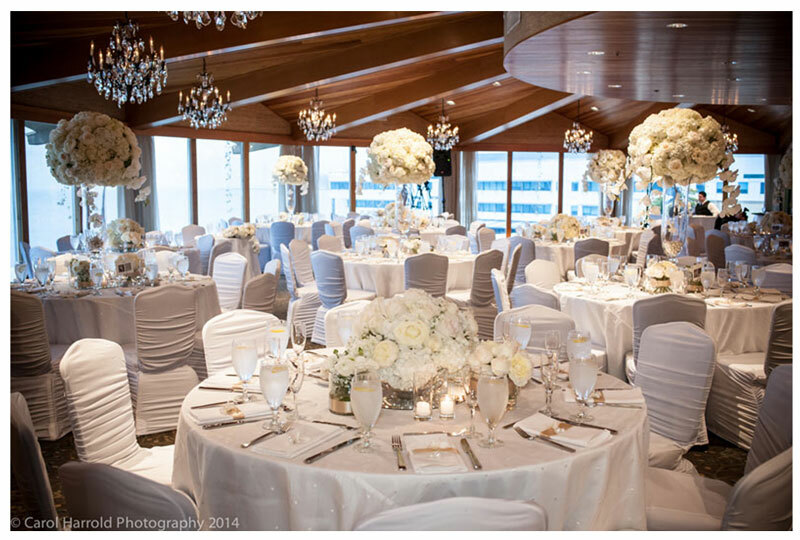 Kaitlyn and Nate’s wedding is combining the lovely winter style with a classic timeless elegance of the white flowers. 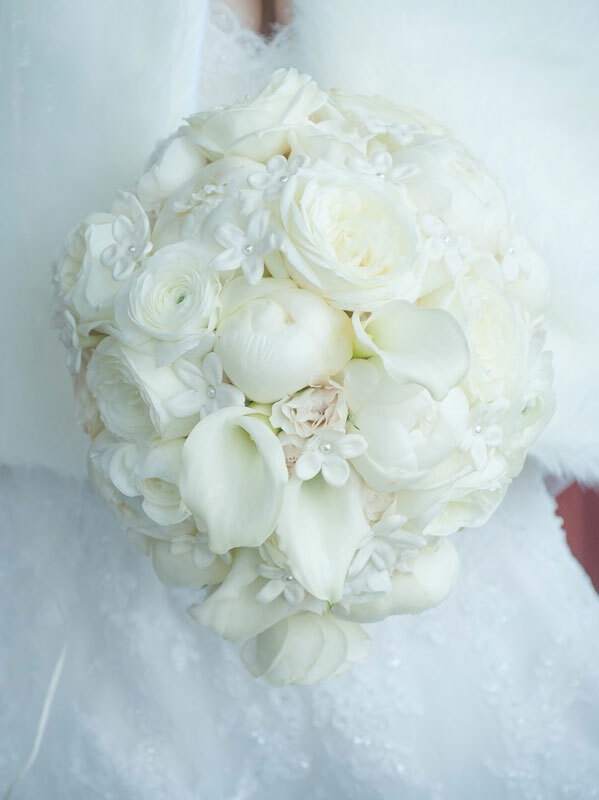 This white tight cascade bridal bouquet made of white peonies, elegant calla lilies, delicate ranunculus, fragrant stephanotis, and garden roses. 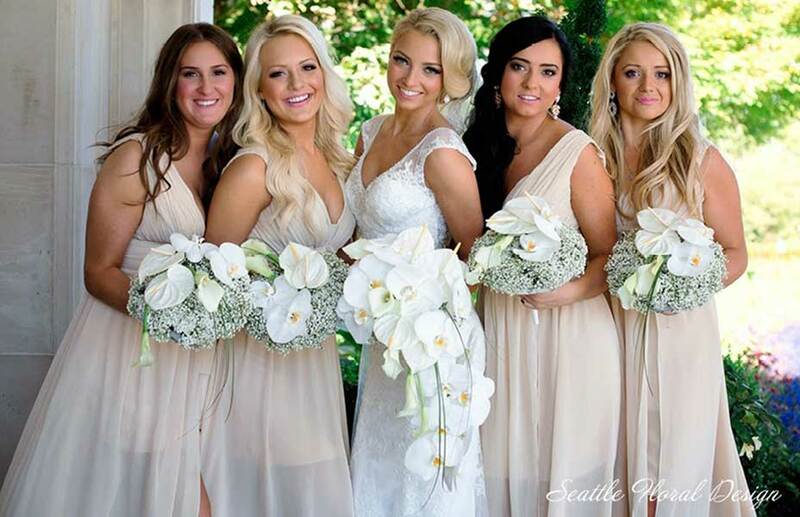 The bridesmaids were holding the favorite bride’s flower, Gerbera. 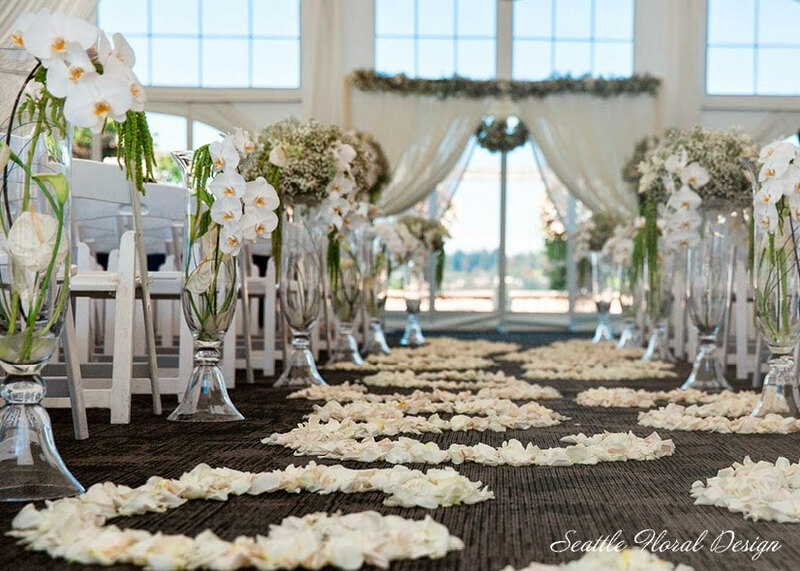 Ceremony arrangements were setup on a top of the beautiful vases that belong to the bride’s family, the same vases their parents had on their wedding day 30 years ago. 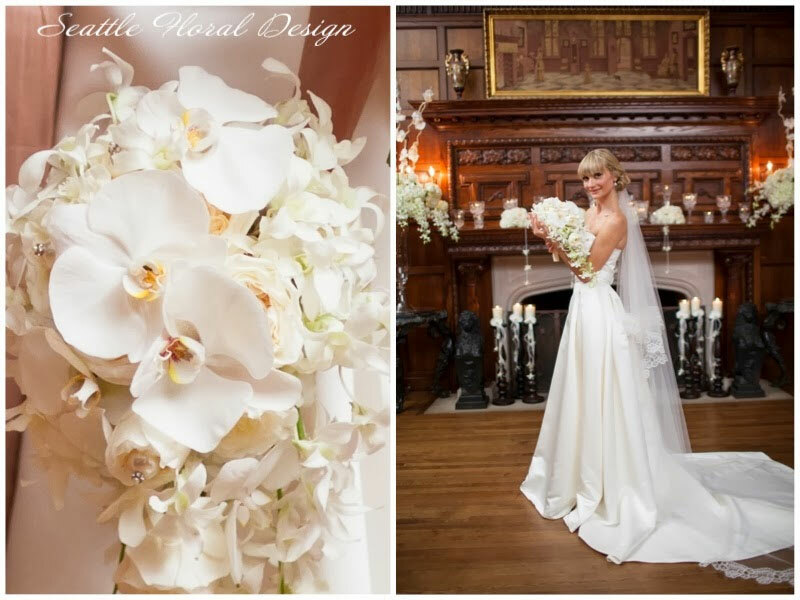 Gorgeous Phalaenopsis orchids, peonies, garden roses, hydrangea made the wedding look stunning. 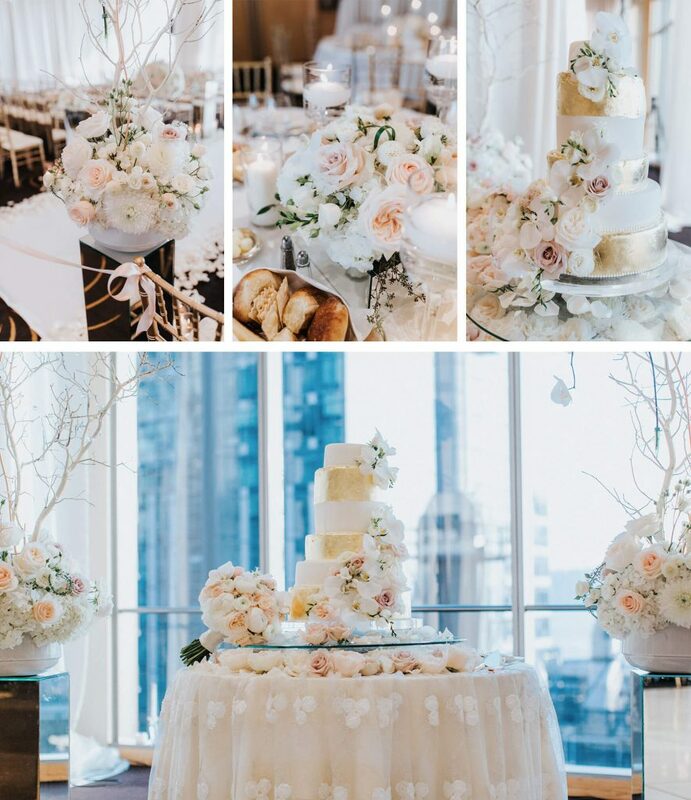 Luxury reception flowers included two type of the arrangement, tall and short centerpieces with Phalaenopsis orchids, peonies, garden roses, hydrangea, stock, and gypsophila. 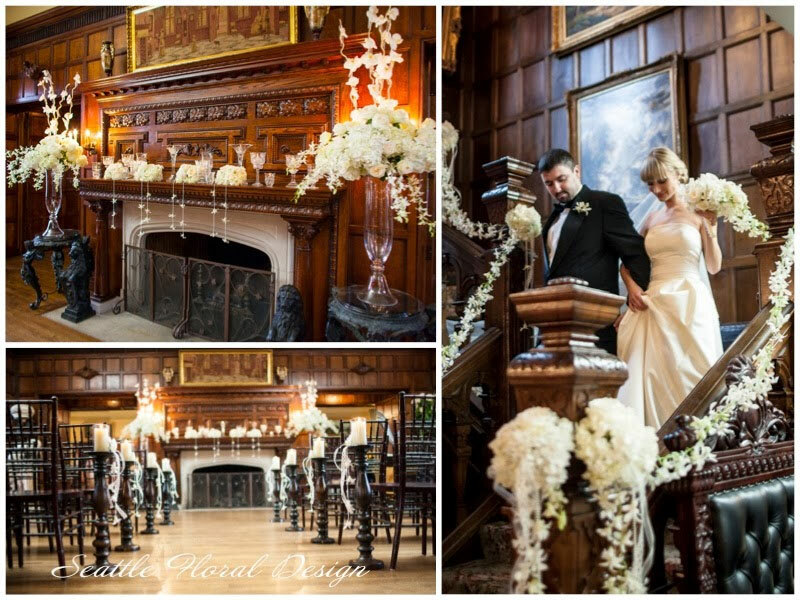 The wedding was taking place at the Newcastle Golf Club, one of the most beautiful and unforgettable locations for the weddings. 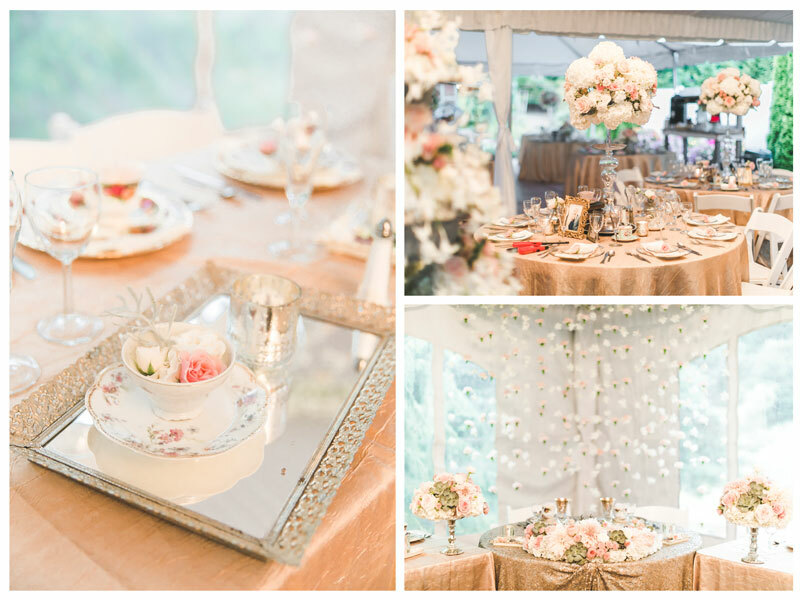 Colors of the wedding were peach, blush, and coral, highlighted with champagne gold for a classic and romantic palette. 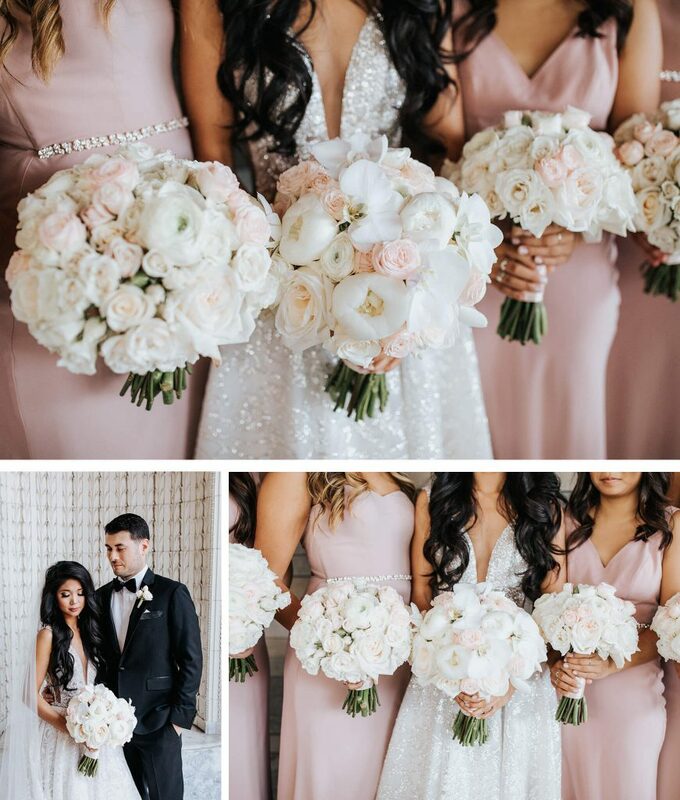 The pave designed bridal and bridesmaids bouquets were made entirely of the different shades of peach garden roses and light coral and blush spray roses, with have multiple small blooms on each stem, tightly packed for a rich romantic look. 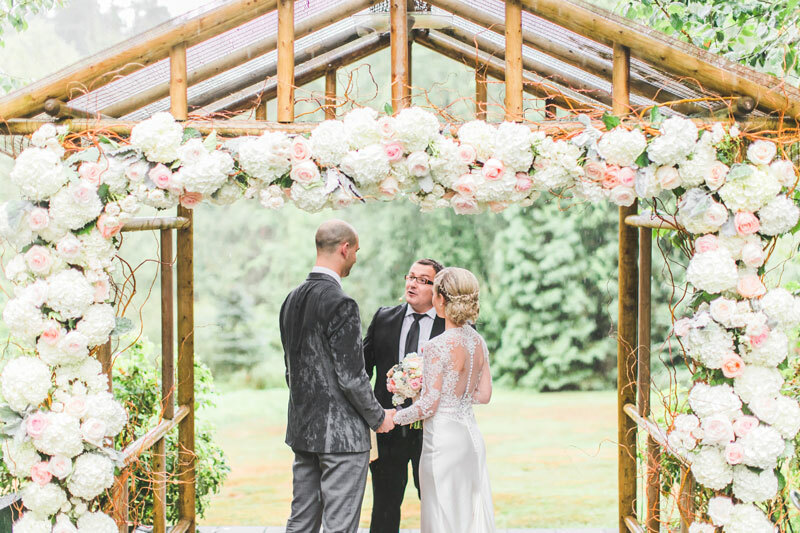 The wedding ceremony was held at the Prestwick Terrace, beneath a floral arch. 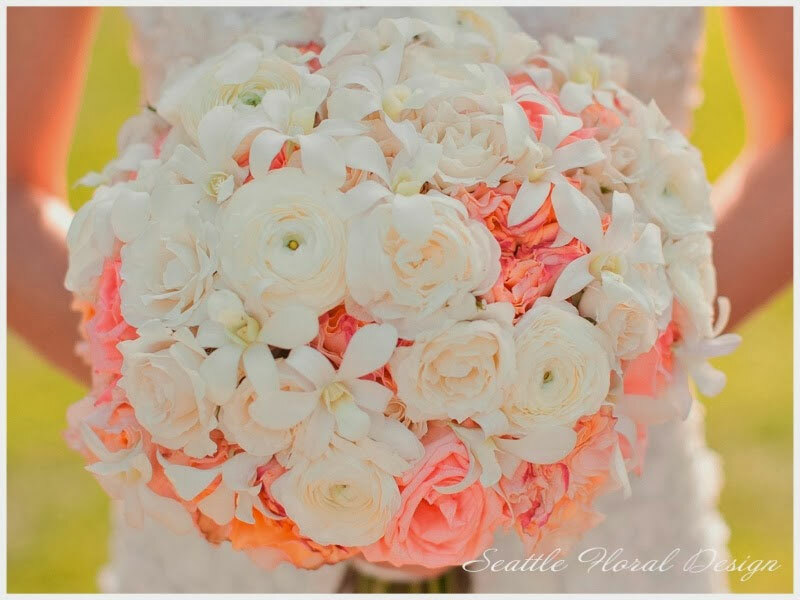 That lovely structure was densely covered with all shades of the peach roses, soft blush miniature roses, coral roses and finished with the garlands of smilax. 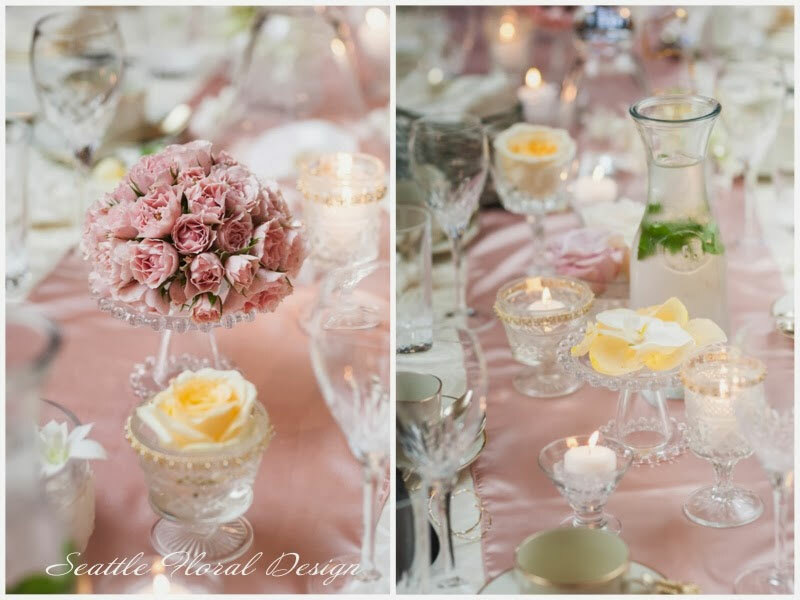 An aisle décor had the vases with the candles and blush miniature roses inside and the rose pedals in a peach color, coved the runner. 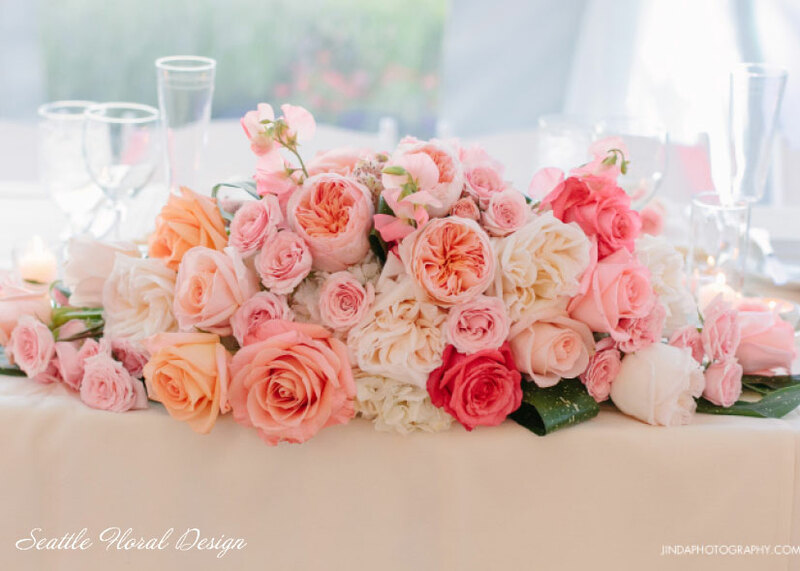 The wedding centerpiece of mixed roses, hydrangea, stock, celosia, and a beautiful garland of smilax anchors the flowers to the table. 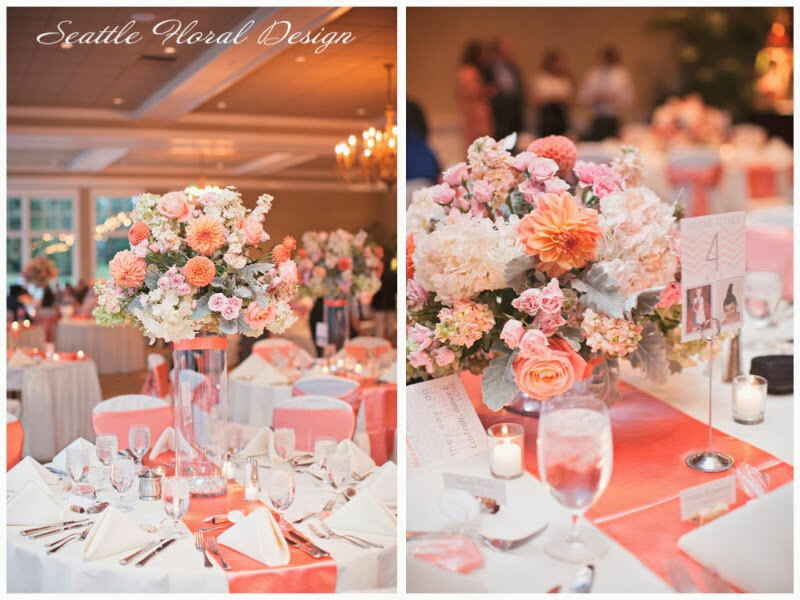 The sweetheart table arrangement was designed using peach, blush, and coral flowers, placed directly in front of the bride and groom. 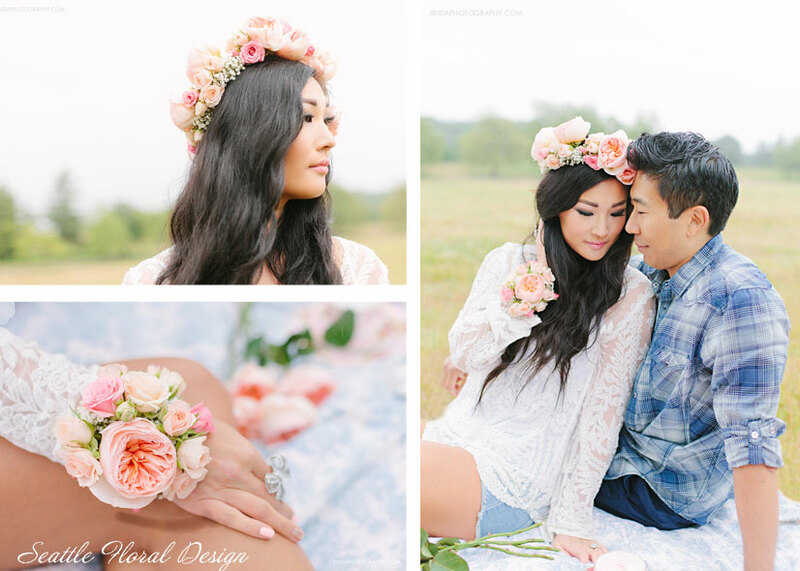 Here are a few pictures of the couple’s engagement pictures. 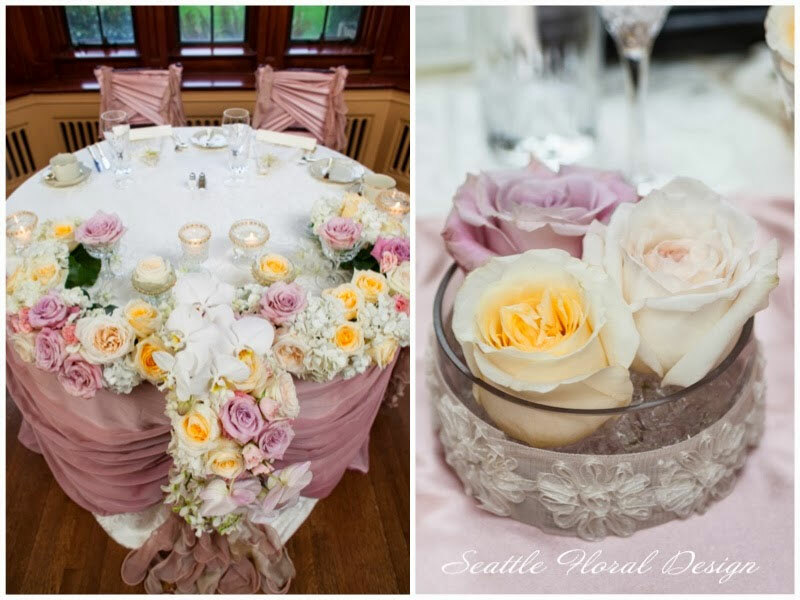 We were using the same colors as for the wedding, peach garden rose Juliet, blush and light peach miniature roses. 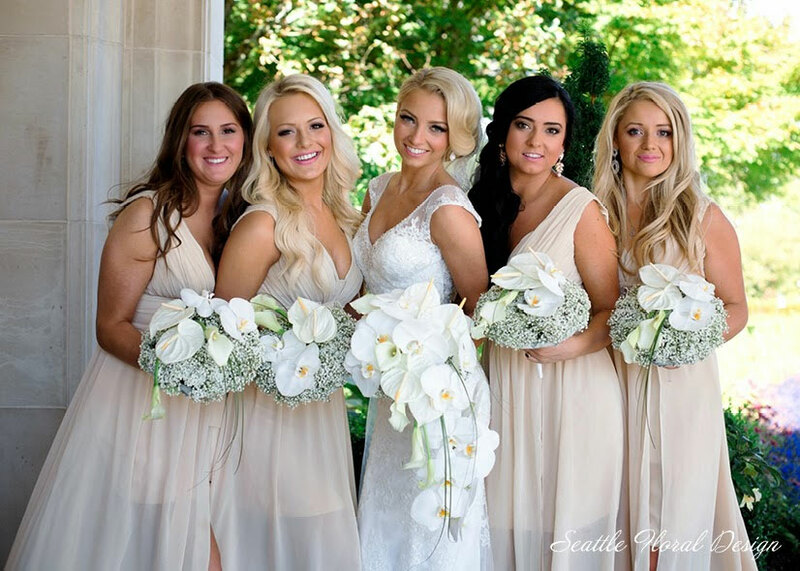 Such a gorgeous bride! 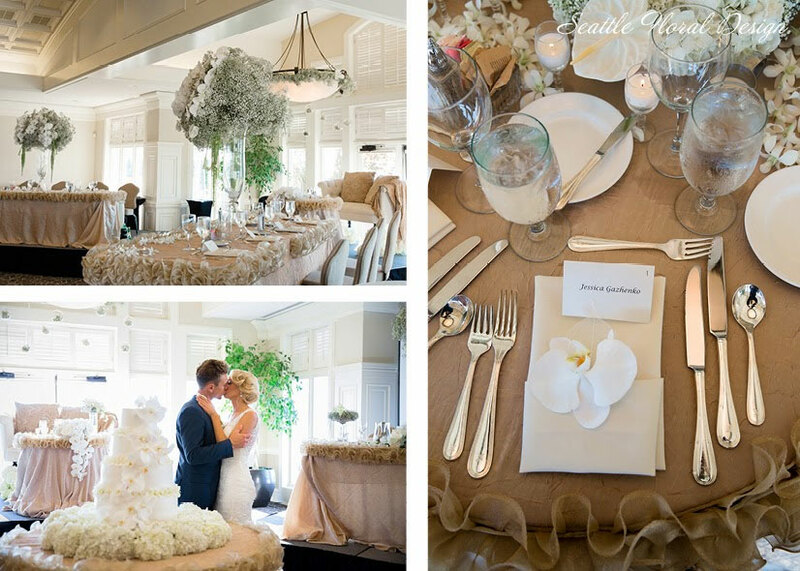 The wedding celebration was held at the Newcastle Golf Club, a perfect setting for your unforgettable event. 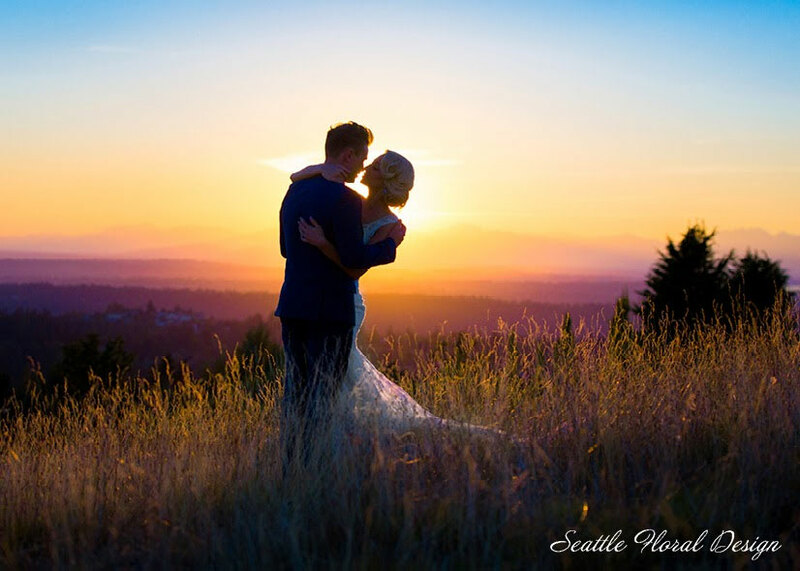 The venue surrounded by stunning view of the Washington Lake, breathtaking scenery of Cascade and Olympic mountains, and Mt. Rainier. The couple was looking for unique look for their event. 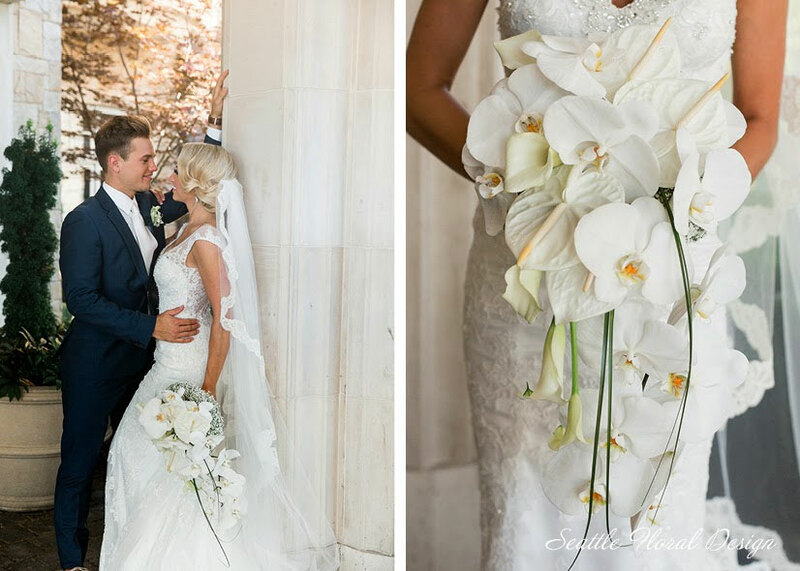 Bride was holding modern and elegant cascade bridal bouquet made of white Phalenopsis orchids, anthorium, calla lilies, and gypsophila. 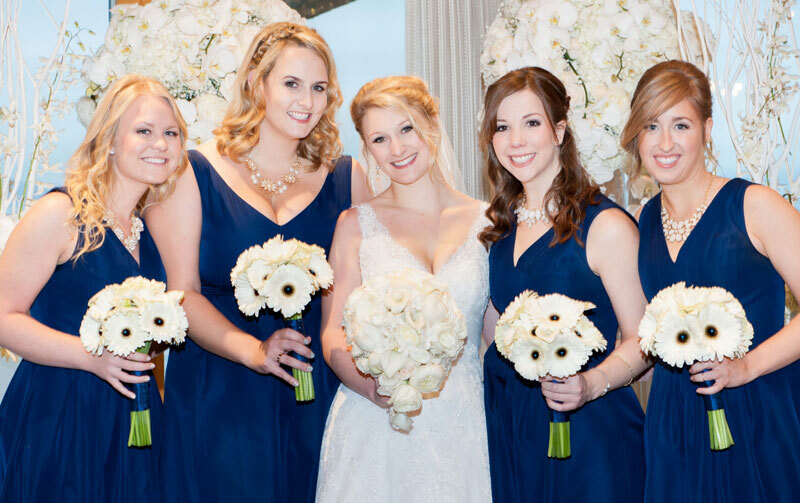 Bridesmaids’ bouquets were created using the same flowers in a different but also contemporary design. 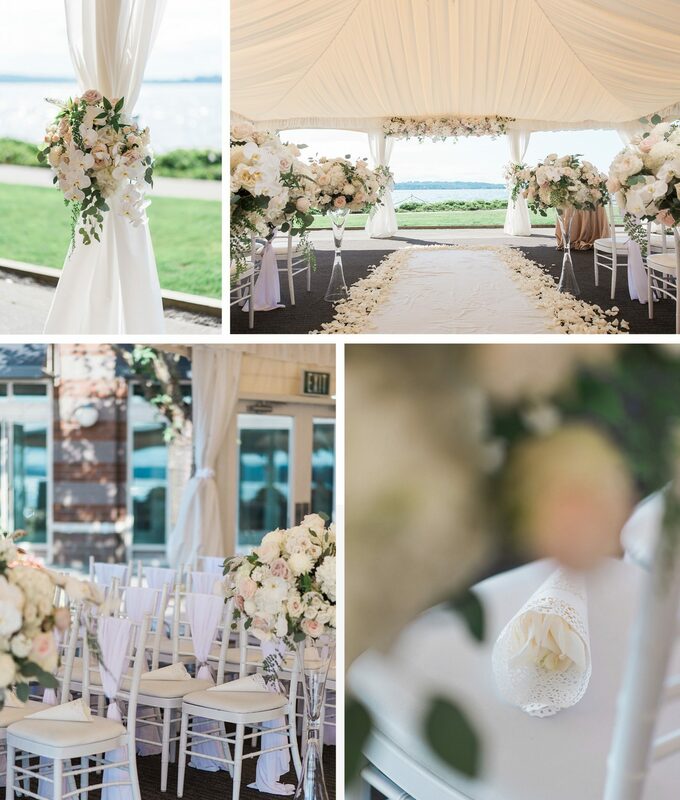 The ceremony site was decorated with a drapery, topped with gyprophila garland, and a chandelier decorated with white orchids. 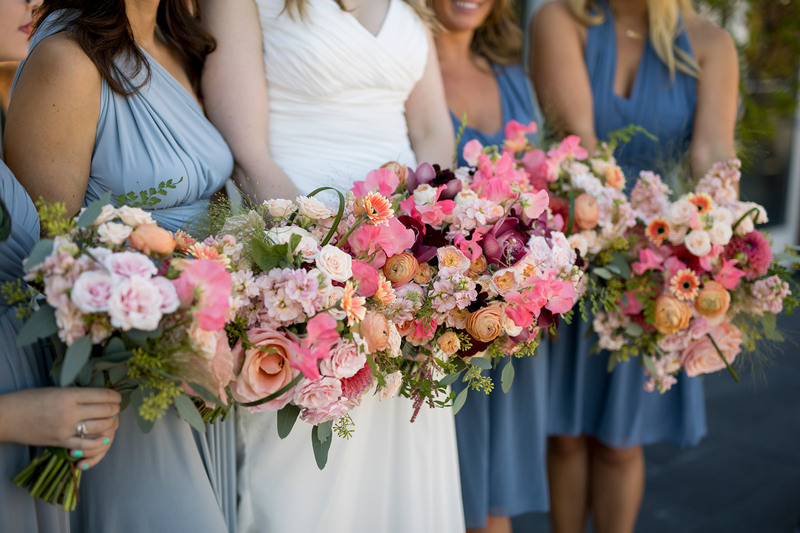 There was a great charm is selecting one main flower, gypsophila. 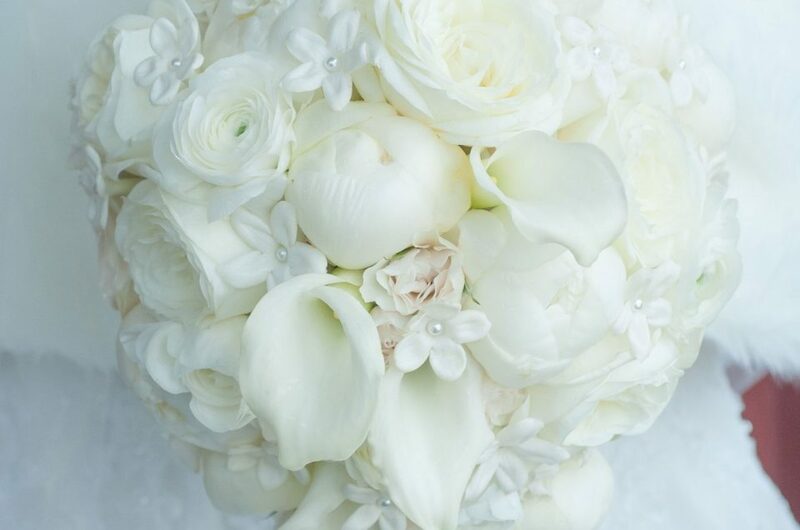 A dense large pomanders of gypsophila are sitting on a top of the vase and punctuated with white Phalaenopses orchids, white anthorium, calla lilies, and hanging green amaranths. 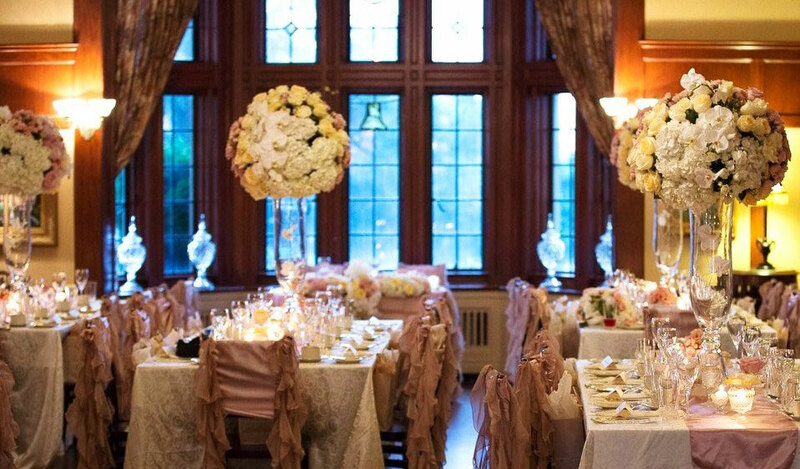 We decorated the chandelier with gypsophila garland and hanging glass balls in an area with the sweetheart table. 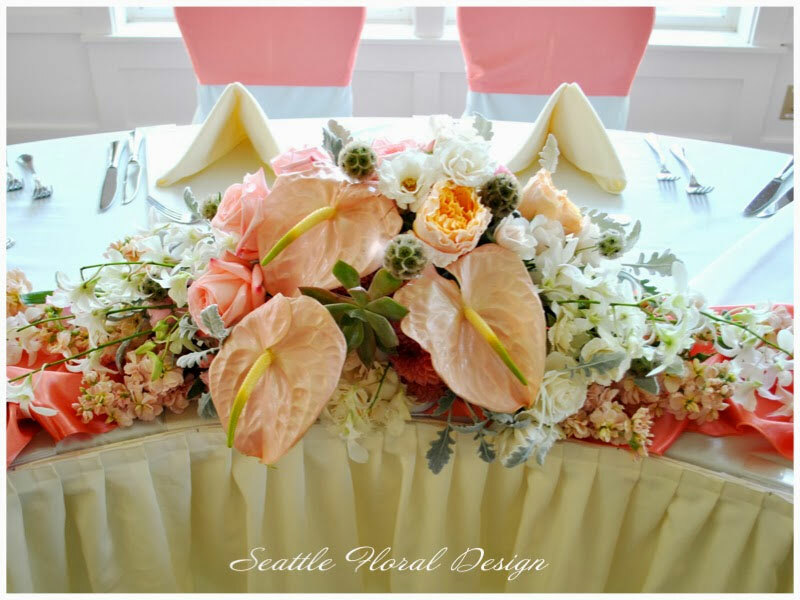 An arrangement on a table of the bride and groom was also created in a cascade design as a bridal bouquet. 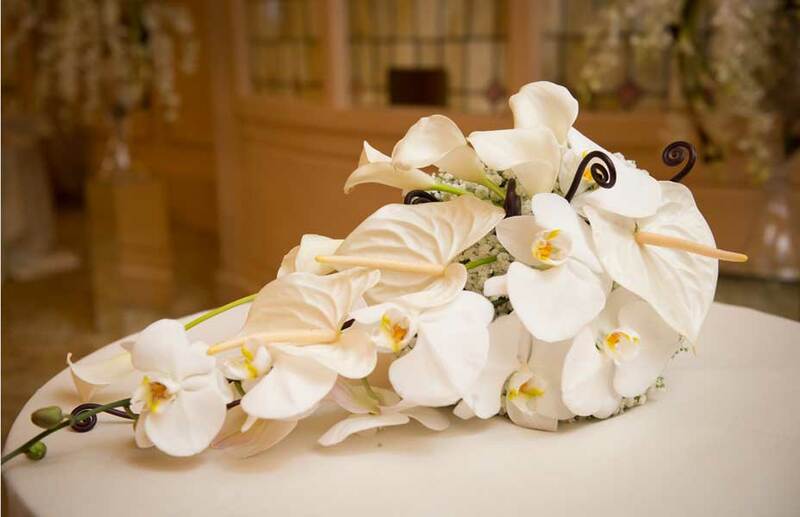 For a contemporary wedding the beautifully simple white cake is finished off with a cascade of smiling Phalaenopsis orchids. 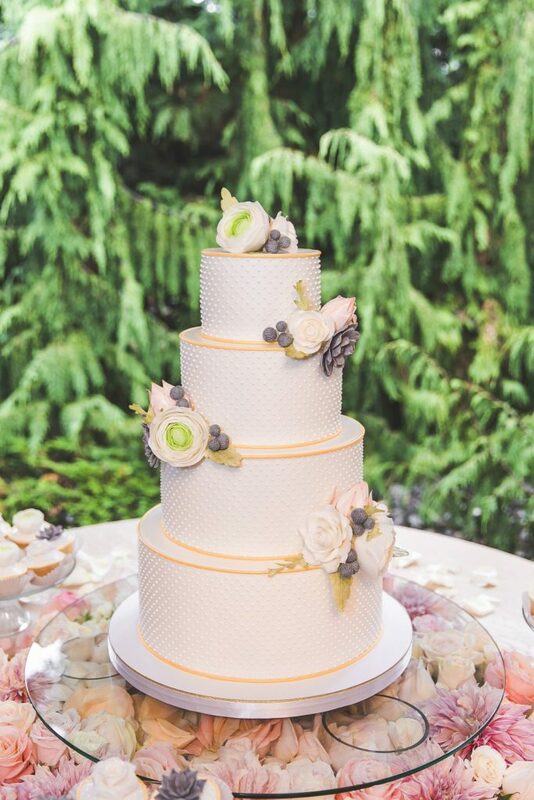 My wedding was more than I could have dreamed of! 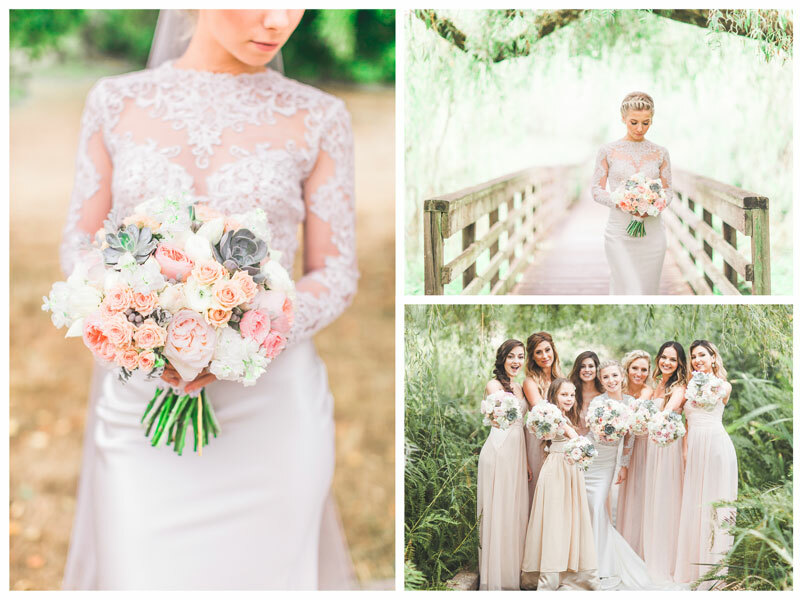 From my dress to the flowers, it seemed like a dream. 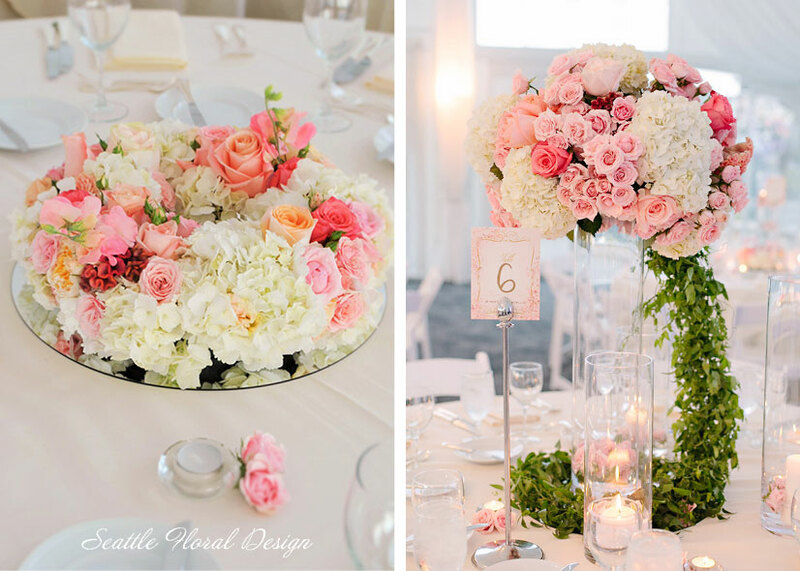 The wedding was in a beautiful venue but all my guests were raving about… the flowers! Working with Lana in the prep days was simply a pleasure. 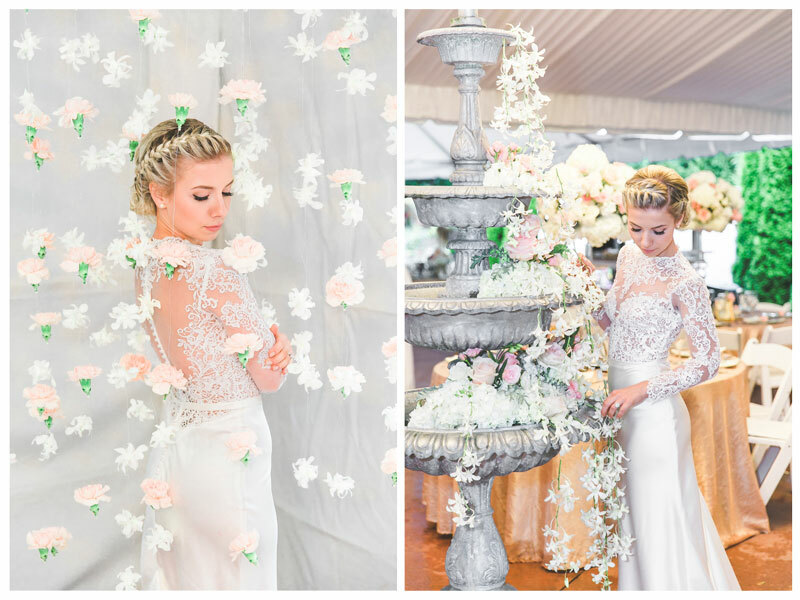 I first saw her work featured at the Newcastle Wedding Expo and I told my fiancé at that time, I have to have this florist! 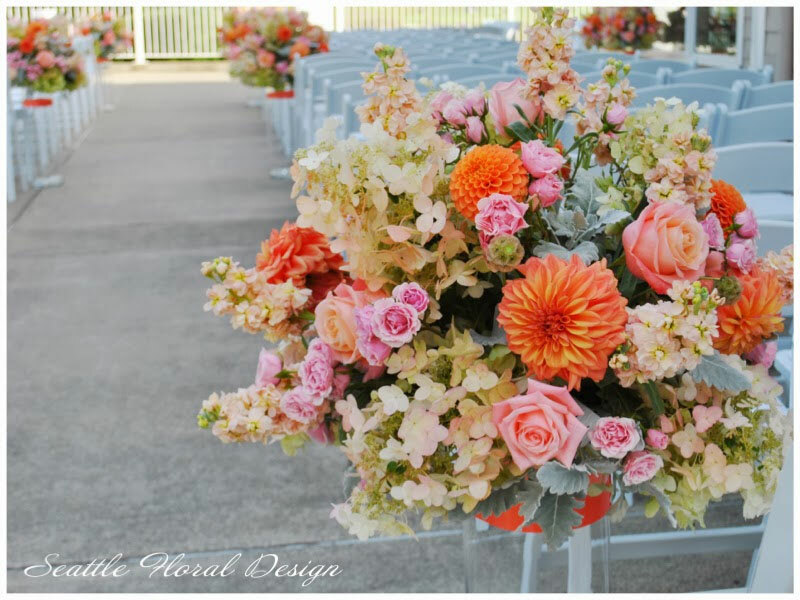 I told him that he can choose all the other vendors but I get to choose the florist. 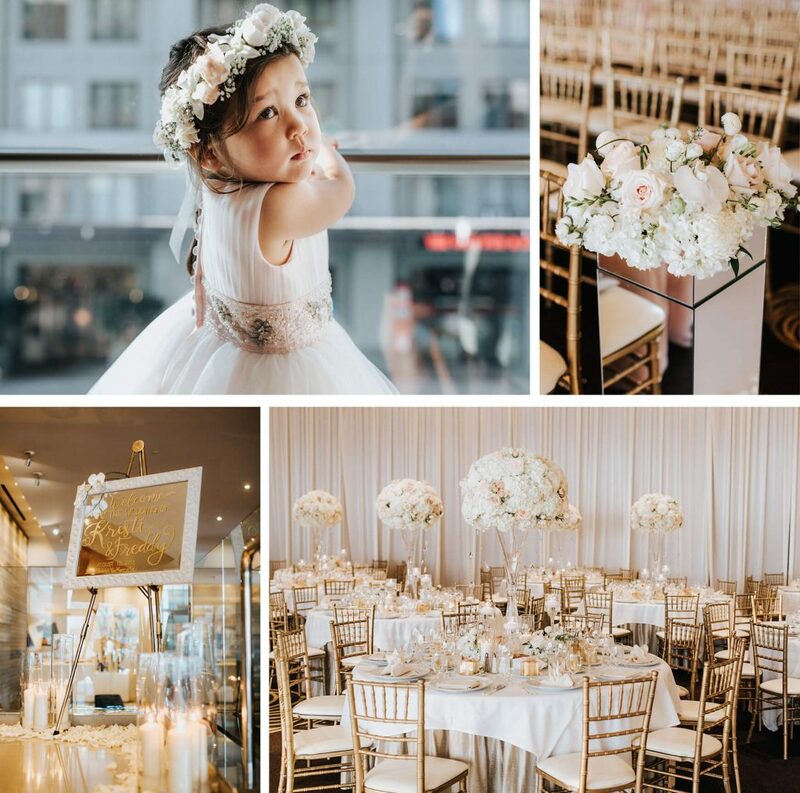 However, when I met her, she informed me that she might not be able to take me a client due to the fact that she had a large event the day before my wedding and it would not provide her with enough time to prep. I was devastated. Yet, she still scheduled a meeting with me to see what our alternative options may be. 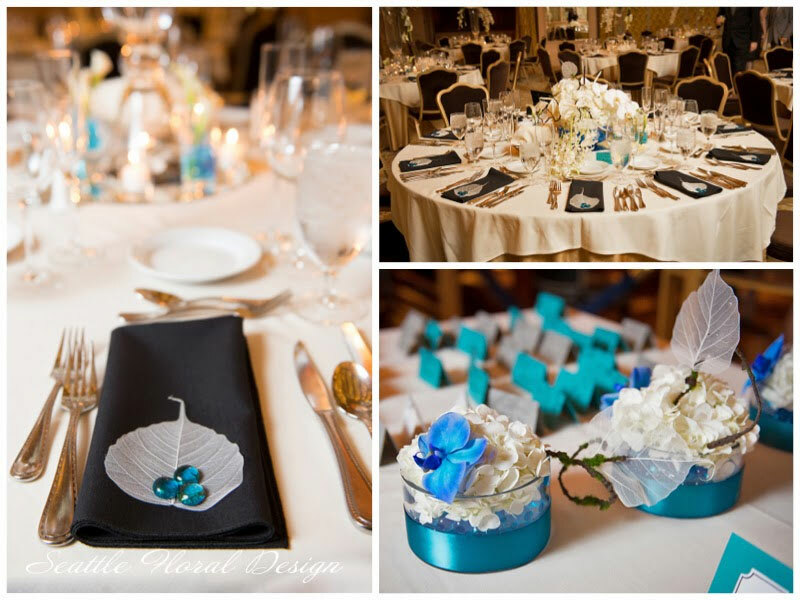 After speaking with her, to my surprise, she worked things out accommodated the dates to make it happen! In fact she was actually excited about doing my wedding! I was extremely happy when we officially booked her for our date. Regarding the expenses, well – all good things come at a price. However, I must say, her work is worth every penny! 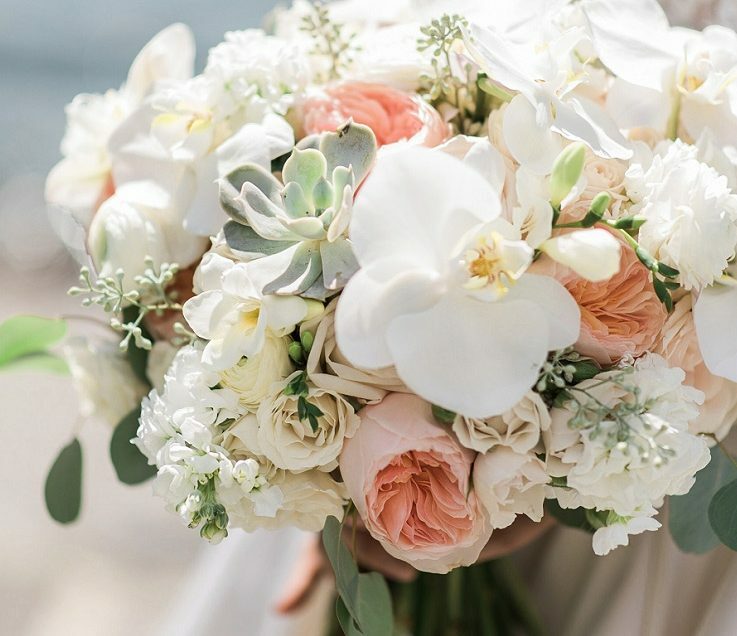 We figured out my budget and she worked so hard to supplement more flowers and still stay within my budget which I so greatly appreciated; she truly cared about making my wedding the absolute that it can be. Also, she is a great listener. 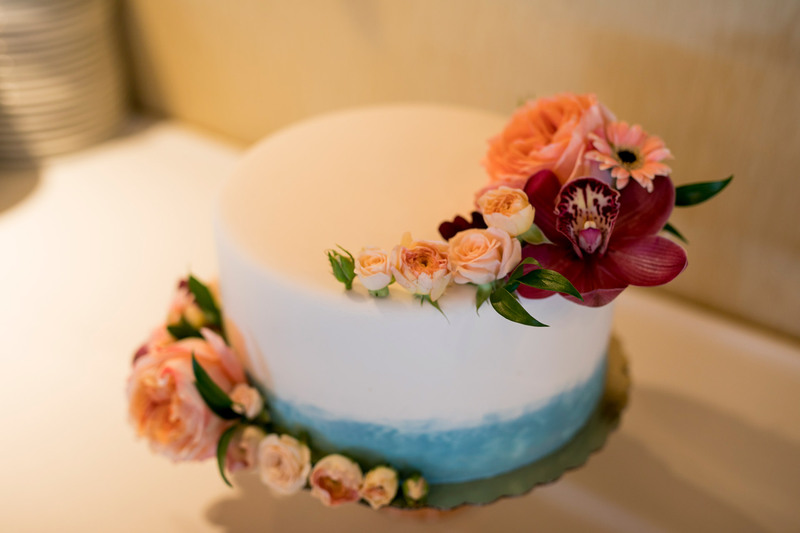 She asked what I envisioned at my wedding and she gave lots of great advice and suggestions. I was grateful for her artistic eye and constant input. 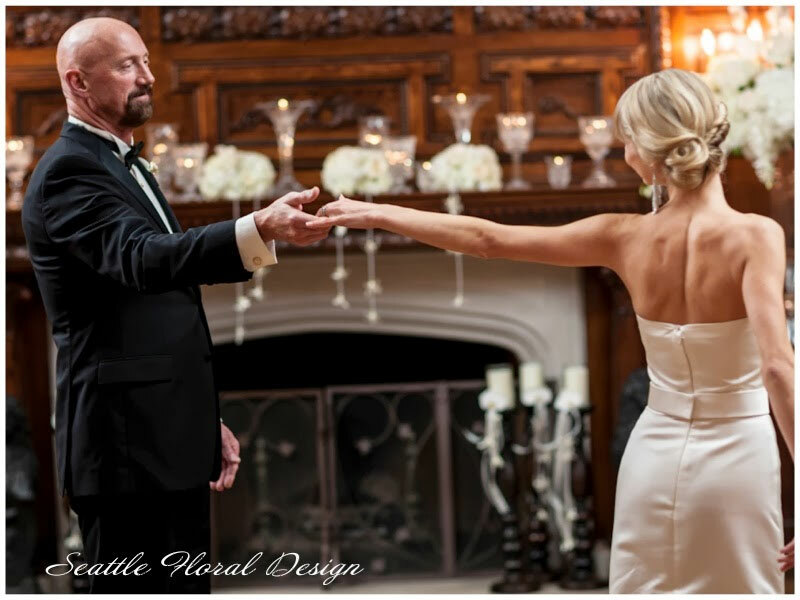 I loved that Lana acted as thought this was the most important day of HER life when I was the bride! She truly exuberates such passion and energy! 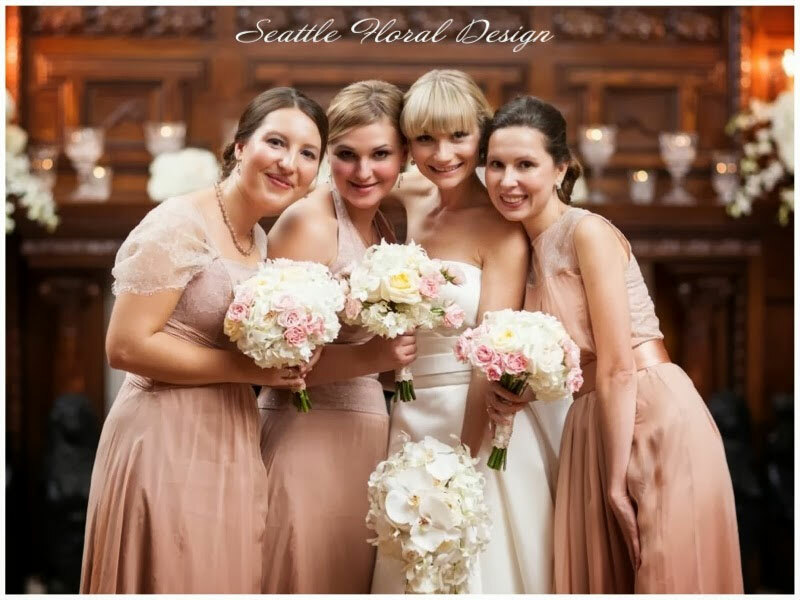 She is very personable and sweet particularly with brides. 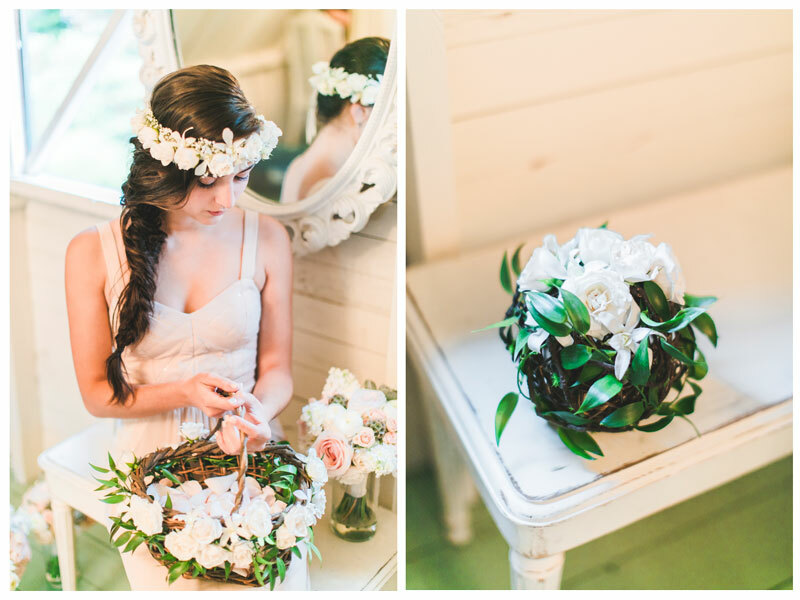 She truly made me feel as though I was her only bride that season!